This is a gnome NPC that wanders around Dalaran. Not currently interactable or attackable. during his stroll, he enters the engineer shop and purchases some schematics from the grand master engineer. He also goes into the wand shop. ...and enters Jedidah's mining shop and shows a magic trick. not sure but he may be related to the achievement "higher learning". The book The Schools of Arcane Magic - Transmutation was in the Legerdemain Lodge on the bookshelf. It remained there until The Amazing Zanzo entered the Lodge and walked past the bookcase to the table. Then the book despawned. I saw him dissappear in the guildbank on the northern wall in Dalaran's Merchants Bank. 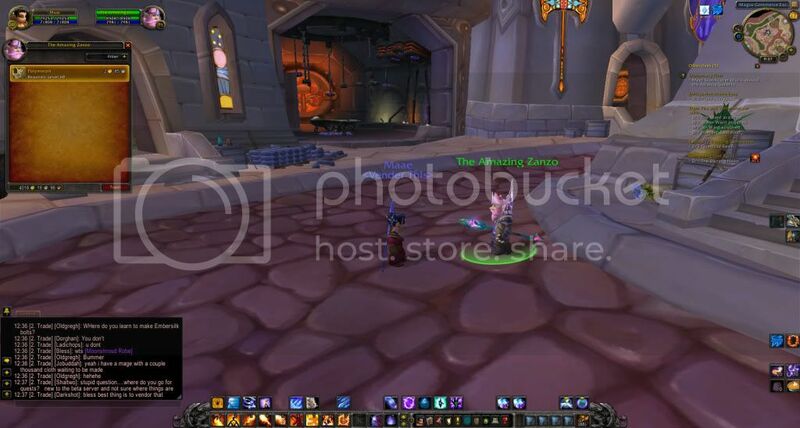 "im in ur guild bank"
He is wearing full mage T6 and using The Nexus Key. Reference to "The Amazing Rando" from the MST3k movie, "Mystery Science Theater 3000: The Movie - This Island Earth." I saw him and I'm thinking, "How do I get 'The Amazing' title?" He's got duo-glows on his staff; Purple on top and orange/red on the bottom. he's an alchemy at the same time, saw him learning new skills from the trainer. Just saw him go into Cartier & Co. Fine Jewelry and learn a few JC recipes. Then he walked to the Legerdemain Lounge and disappeared. He looks as if he's modeled after a character created by Luke Brown, a Warcraft gold-guide author. Please note I'm not trying to spam or advertise, I am merely pointing it out. Just witnessed him walk into Talismatic Textiles and learn new skills. He has mastered 5 professions! He will also polymorph a random player and laugh. Look at my gnome, my gnome is amazing! Apparently this guy also teaches Polymorph: Pig spell. Well, he does in Beta and will hopefully continue to teach it when it goes live. saw him in dalaran today after patch 4.0.3, I was able to interact with him like he is a trainer but he didnt have anything to teach, perhaps something trainable being added in cata? He must be on some sort of spawn timer because I can't find him -anywhere- in Dalaran. Pretty certain he has a respawn and despawn timer. Using the following macro, i flew circles around dalaran on my first loop, i found him but he despawned before i was quick enough to fly to him and purchased piggymorph. Been flying around spamming the macro for 30 mins now and haven't seen him since. Respawn time is about 40 minutes and if he respawn near the alliance bank he will be avaiable only few seconds, be ready for click him! Will there only be only one of these up at any given time? Appeared in the tailor shop for me, trained something from the guy that's standing by the stairs that gives the patterns for the cloaks that require exploring achieves. He spawned at 17:22 server time on the corner by the blacksmith shop. At 17:25 he walked to the leather working trainer. At 17:26 he left and walked to The Legerdemain Lounge where he despawned as soon as he got to the bar at 17:27:30. Arg. Just missed him today as he despawned in front of the Guild Bank in the Merchant's Bank. Server time 2:11, coords: 42.1, 75.6. Boooooo. I'll get him next time. Oink. Just a thought, no need to jump down my throat. You can add 32712 to your NPCScan and it'll pick him up at a fair distance. Just bumped into this guy outside the Dalaran bank on my mage, and found that interestingly he teaches a second Polymorph spell that isn't present on other Mage trainers. You sir, saved me clicking like a fiend for 5 mins. After reading your post, immediatly added Zanzo (wouldn't have thought to otherwise!). Just a few minutes after adding him to npcscan, he popped up right next to the alli bank and kindly taught me piggymorph. ^.^ Less than 2 minutes later, after having visited the Militant Mystic for a new wand, he despawned by the alli guild vault. I was riding in circles in Dalaran looking for him. Came here to see if there was anything special about his spawn cycle. Tabbed back into the game and he was walking past me. Been searchin' for this guy the last couple of days w/o any luck so far. The thing that urks me is that I learned of the alternate polymorph from my girlfriend who had NO idea he was a random spawn and just happened to stumble upon him to get the spell. Go figure for total luck. ...and as I was typing this I f---ing missed him, dammit. So much for the NPC scan I just downloaded alerting me with the bells and whistles that didn't go off! Well, no sooner did I get finished typing my ill-fate than to be pleasantly surprised as he re-spawned at the Alliance bank. Found him using a simple "/target The Amazing" macro, so, maybe I didn't use the NPC scan right, but it seems basic methods won the day. Got him to sell me the spell and now my search is over. All this posting and reposting took about 5-7 mins so who knows what your luck will be. Happy hunting to any who have yet to find him. I just learned Pig Polymorph from Zanzo today, in front of Alliance bank. Today, after /target The Amazing , losing him 3 times while not understanding he could be ìnside one of the shops in the spotted locations, I found him again, with the target macro (took me well over 45 minutes mind you) walking the stairs of the dalaran alliance bank. Also managed to delay him a bit so a fellow mage could be summoned (love it when the guild hits 25) and learn the piggy spell :). Just posting to confirm that with the current patch (4.2.0) this still exists. I just learned the piggie poly from him on a Horde mage. I'm fairly certain that pre-Cataclysm I'd noted him to be "red" to me. I'm not sure if he turned green because I'm a mage or because he's green to everyone now, but I read other posts on here that refer to him as Alliance so I thought I'd post that I got the poly from him as Horde. I found him just outside the Alliance-side bank, the Dalaran Merchant's Bank, by the way. I'd hit ctrl-v to turn on nameplates and found the little guy about to wander into The Militant Mystic shop. Zanzo and Juwanamana are the only mage trainers who can train Polymorph: Pig. Using NPCScan worked for me, he spawned next to the mailbox outside the Alliance bank, a few others spawn there as well. You need to be level 60 to Learn it. After about 15 minutes of searching, and a helpful target macro, I found Zanzo coming out of the north bank in Dalaran. So yes, he's still around but spawns randomly and takes a bit to find. Just a tip: If you once had Polymorph: Pig, you don't need it again. I had done the Archmage quest for the spell in WotLK, but couldn't find it in my spellbook, so I looked for this guy. I really wanted the Polymorph Pig, so I kept looking, after about an hour. Finally, after spam hitting the macro of /tar The Amazing Zanzo I found him!... I already learned the spell. Just to confirm for all those mages out there, he does still sell the polymorph to turn your enemies into adorable piggies. I bought it today - appears the respawn timer is quite quick. Within four minutes of one of the other random NPCs despawning he appeared. Not sure if I was lucky in that respect. Seems they hang around for approx four minutes as after I had purchased the spell and waited, the next random NPC showed up and he despawned. Hope this helps as most of the older comments indicated the NPCS took about 15-20 minutes to arrive. Confirmed for Horde as well. I thought he might be red like all the other Alliance NPC's but he shows up green for us. Found him just now and got it. He appears approximately every 30 minutes for 5 minutes max. I made a video for all the Polymorphs, where to get them, the drop rate etc. Just found him outside of the southern bank in Dalaran. I spotted him about 10 minutes prior using a /target macro, but he despawned before I was able to reach him. The respawn timer seems to be very fast! I paid 2g 85s on my level 98 Human Mage. Yay pig polymorph! In 7.1 he teaches Arcane Momentum so mages can blink based on direction! Found him today in Dalaran in front of the Inn and got the Piggymorph. Didn't have to wait that long. He seem a bit outdated because you can click on "How do I reset my Talents?" and "How do I learn Dual Specialization?" and then waste 10g on learning Dual Specialization which will have no effect since that concept doesn't really exist anymore. You can click on resetting your talents as well which will cost nothing but also do nothing. I found The Amazing Zanzo. I learned Polymorph:pig. Excited, I looked for a target for my new skill, and found a cockroach. No sooner did I polymorph it than some little robot thing, 温顿, popped out of nowhere and killed it. I looked around and found 好运的罗伯特·勒洛尔, picking up the robot. He muttered something about killing bugs and wandered away. Besides Polymorph: Pig, he offers dual specialization for 10 gold, if you accept he takes your gold and nothing happens. He also offers to reset your talents (he doesn't reset anything) and can enable Arcane Momentum (blink the direction you are moving instead of facing). He's an amazing something, alright.